Rocco Mediate had already sent in his check, the one that would allow him to attend the PGA Tour's most dreaded tournament -- Q-school. For some, the officially named PGA Tour National Qualifying Tournament signifies hope and a bright future. It is where careers begin. 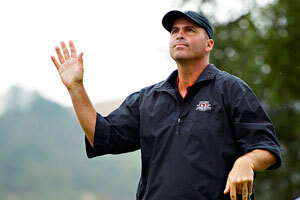 Robert Laberge/Getty Images Rocco Mediate made four eagles last week at the Frys.com Open including a hole-in-one in the opening round. But when you are about to turn 48, showing up to a six-day, 108-hole tournament among a bunch of eager, long-hitting kids more than 20 years younger, it offers no such dreamy illusions. That is where Mediate was headed until his improbable victory on Sunday at the Frys.com Open, where he holed out a shot for eagle during each of the four tournament rounds and won his sixth career title, but first since 2002. Anything short of a victory, however, and Mediate would have teed it up in Las Vegas at this week's Justin Timberlake tournament in search of more magic. He was so far down on the money list -- 182nd -- that even a second-place finish would have left him out of the top 125 and in need of more finishes in the money to secure his PGA Tour job for 2011. He had missed the cut or withdrawn from 12 of his first 16 events in 2010, beginning to show some form only in early July. Since then, he had made the cut in six out of seven, his best finish a tie for 15th at the John Deere Classic. And then he goes out and wins the tournament near San Jose on a course he had never seen while watching guys drive a par-4 all around him where he had to lay up. Of course, he holed the approach shot -- at the 17th hole on Sunday -- and ended up winning by a single stroke. For a 25-year veteran like Mediate, it doesn't get much better. "I have a job," Mediate said afterward. "I signed up for tour school, and I was going to go. That's where I belonged about a half-hour ago; I don't belong there anymore." The victory moved Mediate to 78th on the money list, but more importantly, it gives him a two-year exemption through the 2012 season. And it points out, again, what one good week on the PGA Tour can mean. In 2008, Mediate had a lone top-10 finish in 17 starts, including eight missed cuts, heading into the U.S. Open -- which he made only through a sectional qualifier playoff. Once at Torrey Pines, however, Mediate captivated the masses by taking on Tiger Woods. He would have become the oldest U.S. Open champion if Woods hadn't birdied the 72nd hole to tie him, forcing a playoff, and made birdie again at Torrey's 18th during the playoff to force extra holes, where Mediate finally succumbed. It was Woods' 14th major championship, but Mediate had earned the respect and admiration of the golf world for the way he played, nearly pulling off the big upset. But since then, Mediate had posted a single top 10 in 55 events before the Frys.com Open. He finished 145th on the money list last year, meaning he had to get a lot of sponsor exemptions this year. He was staring at the same fate in 2011, with a bad back making the journey that much tougher. Now Mediate can relax. He can book a trip to Hawaii for the season-opening event at Kapalua. He's a good bet to make several of the invitational fields. And he's got a place to play until the Champions Tour comes calling. And that is why these Fall Series events have a ton of meaning even while the majority of the sports world is focused elsewhere. After this week's tournament in Las Vegas, the Fall Series takes a two-week break for two unofficial events in Malaysia and China. Then it concludes with the Children's Miracle Network Classic at Walt Disney World. There's been plenty of talk lately about the Official World Golf Ranking, which appears set to have a new man at the top come the first of the month. Lee Westwood is scheduled to supplant Tiger Woods -- unless Germany's Martin Kaymer beats him to it -- knocking Woods off a perch he's held for more than five years straight. Vijay Singh had taken over No. 1 for two brief periods in 2004 and 2005 -- on the heels of an incredible run -- but before that, the last player to hold the top spot was David Duval in 1999. Duval's fall following his 2001 British Open victory has been well-documented. The last time he finished among the top 125 on the PGA Tour money list was 2002, a long eight years ago. Even a tie for second at the 2009 U.S. Open was not enough to push him over the top for 2010. But playing with conditional status for having finished 130th last year, Duval, who turns 39 next month, is set for a return as a fully exempt member of the tour. His tie for sixth on Sunday at the Frys.com Open moved him up 10 spots to 99th on the money list, and with just two events to go, he is a lock to have full status next year. That's a long way removed from contending for majors, holding the No. 1 ranking and racking up tournament titles. But it is a tribute to Duval's perseverance. He's had very little success over the past few years. Even this year, he's missed 13 cuts and made only 10. He has just two top-10 finishes, but a tie for second at Pebble Beach and the tie for sixth near San Jose, along with three other top-30 finishes, were enough to get the job done. Quietly, and with little fanfare, the European Tour last week raised to 13 the number of tournaments a player must annually compete in to retain membership. That's two straight years now that the tour has hiked its minimum by a single tournament. The rule was passed at the European Tour event in Portugal, but by Friday, U.S. Open champion Graeme McDowell had yet to hear about the change. And McDowell is one that it is likely to affect, since he plans to play the PGA Tour as well in 2011. While this is an obvious move to try to keep as many of its stars playing in Europe as possible, it is also one that should not be considered a hardship. Remember, the four major championships and the four World Golf Championship events -- including next month's HSBC Champions in China -- count on both tours. That means a player who competes on both tours needs to add another seven on the PGA Tour and another five in Europe. Or a total of 20. And that is not unreasonable, although it requires a good amount of scrutiny to get it right. "It's very important to prioritize, to not get sucked into playing too much golf around the world and not beating myself up too much," McDowell said. "My scheduling is going to be very, very important to me next year." One area where it will be easier to add a European Tour event will come in the form of the World Match Play Championship, which was off the schedule this year but will return in 2011 the week prior to the tour's biggest nonmajor event, the BMW PGA Championship at Wentworth. It is quite possible that many European Tour members will simply add the match play the week prior. TPC Summerlin. The Las Vegas course that hosts the Justin Timberlake Shriners Hospitals for Children Open is a private venue that is part of the TPC network of courses. This is just the third time that the Vegas event has been contested on just one course. The 7,243-yard, par-72 layout has to be a pushover for PGA Tour players. Last year, Scotland's Martin Laird won the tournament, shooting rounds of 63-67-67-68, then defeating George McNeil and Chad Campbell in a playoff. To make the cut, a player had to be at 138, 4-under par. The Las Vegas tour stop dates to 1983, when Fuzzy Zoeller won the 90-hole pro-am event that was played over four courses. Chip Beck became just the second (of now five players) in PGA Tour history to shoot 59, doing so in 1991 when the tournament had a three-course rotation. In 2004, the tournament cut down to 72 holes, and in 2005 it went to just two courses before going to the single venue two years ago when Timberlake became involved in the event. 1. Rocco Mediate. It should actually be an eagle, as Rocco made four of them -- one each day -- to claim the Frys.com Open by a single stroke. 2. Padraig Harrington. Finally, a victory for the Irishman. This one came at the Iskandar Johor Open, an Asian Tour event played in Malaysia. Harrington had not won since his 2008 PGA Championship triumph. 3. Jason Gore. He won for the seventh time on the Nationwide Tour, although his victory Sunday still leaves him short this year of earning enough money to get his PGA Tour card in 2011. 1. John Daly. He's made a commendable 13 cuts in 19 tries this year, but just over $150,000. A final-round 82 on Sunday at the Frys.com Open was part of a trend of poor final rounds. 2. Bo Van Pelt. He's got to be kicking himself over that three-putt on the 17th green -- which he drove -- at the Frys.com Open, which ultimately cost him a spot in a playoff. 3. Anthony Galea. The Canadian doctor was indicted last week for his involvement with several prominent athletes, including Tiger Woods -- although none of the players have been charged with criminal activity. • Rocco Mediate became the oldest player (at age 47 years, 10 months) to win on the PGA Tour since Kenny Perry last year at the Travelers Championship. Perry was 48 years, 10 months. • Mediate's win was the seventh by a player in his 40s this year. Steve Stricker (2), Jim Furyk (two of his wins came before turning 40), Cameron Beckman and Ernie Els (2) were the others. • Jose Maria Olazabal, a two-time winner of the Masters and the best guess as the next European Ryder Cup captain, returns to competitive golf this week at the Castello Masters in Spain. It is just his second tournament in a year, as Olazabal has been batting rheumatism. • Sergio Garcia also returns this week, at his home club. Garcia had taken a two-month break since the PGA Championship after now falling to 68th in the world rankings. He had been as high as No. 2 in March 2009. "I needed to miss the game a little bit," he said. • Asked about the rainsuit debacle at the Ryder Cup, Tiger Woods said this week during a media day for his Chevron World Challenge: "I think that those are issues that should be resolved before we get there so they're not an issue while playing. Come tournament time, there are always going to be things that pop up, and you just have to deal with them. It happens in every team event I've ever been a part of. But little things like that, I think, could have been taken care of so they weren't an issue. Or at least have been tested prior to game time so that any kind of corrections that could have been made, would have been made." "Two years is a long time, especially when you're reminded every week you play. It's nice and very important for me to win. It's somewhat of a monkey off your back." -- Padraig Harrington after his first victory in more than two years, at an Asian Tour event in Malaysia. Three of Martin Laird's eight career top-10s on the PGA Tour have come in the state of Nevada, including the Justin Timberlake Shriners Hospitals for Children Open, where he is the defending champion this week. Last year's victory, in a playoff over George McNeil and Chad Campbell, came when Laird was outside the top 125 on the money list. It gave him a two-year exemption and helped him finish 65th on the money list. This year, Laird has three top-10s, including a playoff loss at the Barclays to Matt Kuchar. Laird finished 11th in the FedEx Cup standings -- meaning he'll have spots in the first three majors next year -- and has earned more than $1.79 million. Horse for the Course. Charley Hoffman. This is a home game for Hoffman, who lives in Las Vegas and has had top-10s in two of his past three starts. Birdie Buster. Rocco Mediate. He's coming off an impressive performance at the Frys.com, where he made an eagle each day on his way to victory. Super Sleeper. Anthony Kim. He's still recovering from the thumb surgery that interrupted a great year. Winner. Hunter Mahan. What better way to get over the Ryder Cup than to win your first start back?